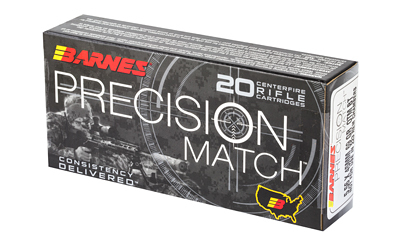 With the introduction of the most accurate commercially loaded round on the planet, Barnes enters the world of match ammunition in 2015 with Precision Match. 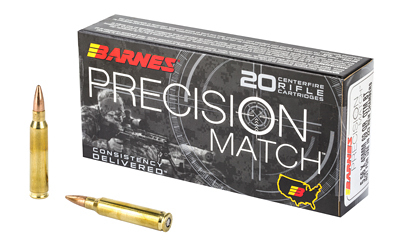 As a proud supplier of precision ammunition to America’s Military Elite, Barnes makes top tier ammunition commercially available for the elite, technical shooter who demands uncompromising performance. Precision Match Ammunition delivers exceptionally accurate, long range allowing the shooter to SEND IT WITH CONFIDENCE every time. 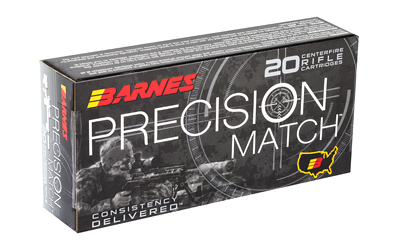 Precision Match, engineered for precision at extreme distances, features exceptionally low standard deviations and extreme variations due to Barnes’ exacting manufacturing and quality standards. 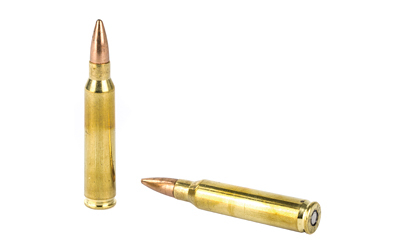 Precision Match rounds are loaded with a match grade OTM (Open Tip Match) BT projectile featuring a long boat tail and high B.C. As an additional bonus, scan the QR code located on the back of each box to view Doppler radar generated drop tables specific to each load. Precision Match will be offered in 5.56 X 45MM 69 grain OTM BT, 5.56 X 45MM 85 grain OTM BT, 6.5 Creedmoor 140 grain OTM BT, 308 Win 175 grain OTM BT, 300 Win Mag 220 grain OTM BT, and 338 Lapua Mag 300 grain OTM BT.